Chlorination is the addition of chlorine in drinking water to destroy the pathogens in water. 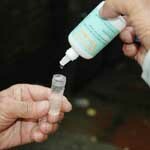 Chlorine destroys the germs and bacteria that could be present in the water. When chlorine is added into the water, it is initially consumed by the metals, minerals, slime and organic matter in the water. Some amount of chlorine combines with ammonia in water. 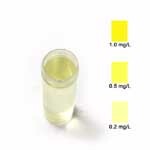 The chlorine left free after all these reactions in called "Free Residual Chlorine" (FRC). The World Health Organization (WHO) recommends 0.2mg to 0.5mg FRC in 1 litre of drinking water. 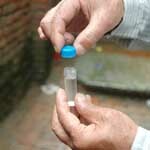 Nepal Drinking Water Quality Standard 2006 also follows the WHO guideline value. 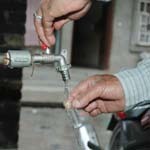 Presence of FRC in water ensures germ-free water for consumption. Low FRC value (less than 0.2mg per litre) means incomplete destruction of germs in water making it unsafe for drinking. Such water must be treated with household water treatment methods like boiling, filtering, SODIS or use of chlorine solution (Piyush/Water Guard) before consumption. 5. Match the colour change with the colour chart in the reagent bottles to know the FRC value. 2. Type in your username and password in the login form of the home page. 3. After you are logged in click add new survey data in the NGO Forum survey dialogue box. 5. Type in the time of FRC test in 24 hour format. 6. Select the respective FRC Value from the drop box. 7. You can click reset to correct any mistakes. 8. Click submit to submit the data. 9. Log out from the site.